If you’re in Pittsburgh this Saturday night, August 2nd, come to the new home of Hot Metal Bridge (2700 Jane St., South Side), and hear Tony Jones, Doug Pagitt, and Mark Scandrette in the Church Basement Roadshow. It starts at 7:00pm, and there’s $10 suggested donation. Their new website Rethink Christianity is definitely worth a look, too. Good Books from Brazos . . .
I’m really excited about a series of books I recently discovered: Brazos Press’s Christian Practices of Everyday Life Series. 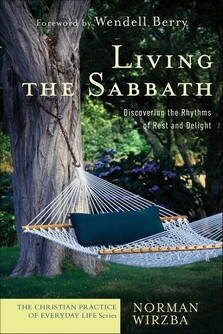 Last week I finished reading Norman Wirzba’s Living the Sabbath. Impressed by Wirzba’s articulation of the importance (and challenging counter-cultural call) of living a sabbath lifestyle in our world, I decided to check out some of the other books in the series. Now I’m reading Eric Jacobsen’s Sidewalks in the Kingdom: New Urbanism and the Christian Faith, and Eileen’s reading Elizabeth Newman’s Untamed Hospitality. If you’re looking for thoughtful books on how to live out your faith in the midst of contemporary culture, these are definitely worth your time. The cultures represented in the neighborhood of our NCD require us to participate in interreligious dialogue. This requires a certain intellectual bent, for which an introverted personality is helpful. Introverts prefer serious conversation over small-talk, and in a well-educated neighborhood (right next to a major university), serious conversation won’t be hard to find. We don’t plan to become a mega-church. Instead, our vision is highly relational and discipleship-focused, which means that we value deep relationships over many shallow ones. My hopeful (but as of yet untested) opinion is that the key to being an introvert in church-planting is finding that rhythm of contemplation and rest that recharges one’s batteries, in turn providing energy for the more labor-intensive times of needing to meet new people. It’s just the same on the congregational level. A new church has to be “outgoing” in order to survive, but it also needs time to contemplate in order to solidify its identity. This is why our vision statement includes “equipping” and “sending”. They aren’t stages in a process – they’re rhythms of being equipped and being sent which the whole congregation will need to live into every day. And if that rhythm is present, I believe that introverts can be very effective church-planters. Now please pray that I’m right.